Minoan Palatial Centres (Knossos, Phaistos, Malia, Zakros, Kydonia) is part of the Tentative list of Greece in order to qualify for inclusion in the World Heritage List. 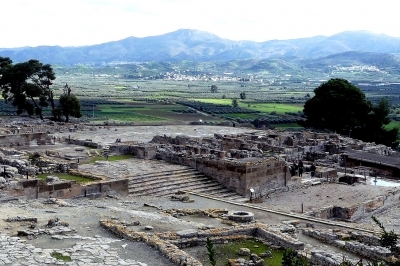 During a stay on Crete in the summer of 2018 I visited two of the properties of this serial site. One of them, Knossos Palace is the most visited tourist attraction on all of Crete. Although British archaeologist Arthur Evans, who excavated Knossos in the early 20th century, firmly placed the palace as the residence of the mythical King Minos (and named the whole civilization after him), you will not find any remains of the Minotaur’s Labyrinth here. Instead, among the ruins of stone walls and buildings, you will find partial recreations of structures as they existed thousands of years ago. While the relatively young age of these recreations is obvious to the naked eye, they are considered very faithful facsimiles. There are a couple of interior spaces among the recreations as well as a few paintings – none of which are originals, of course – which enliven the scene a lot. All of that makes Knossos almost “livable”, especially compared to a site such as Phaistos (sometimes transliterated into Latin alphabet as Faistos). The two are contemporaries, although Phaistos Palace came to ruin and disuse a few centuries earlier than Knossos, around 1450 B.C. There are no reproductions at Phaistos, only whatever has been excavated in the shape that it was found. An expert in archaeology may actually find that more authentic and rewarding. For a layman visitor, an uncommon power of imagination is required to discern anything more than terraces of piles of rocks, no matter how much explanatory details are provided in the accompanying materials. Occasional obvious artifacts do pop up, and the surrounding valley views are spectacular. Unless you are a devoted student of archaeology, I suspect that you will find Phaistos boring. Knossos, on the other hand, is well worth the visit. It probably pulls my overall mark for the property to 3 stars. Knossos is just a few minutes away from Heraklion by car, while Phaistos is a bit over an hour away. In Nov 2015 I reviewed our visit to Knossos (below). In Dec 2018 we “found ourselves” in Crete yet again and visited a further 3 of the 5 “Palatial Centres” (as well as re-visiting Knossos and the fabulous Heraklion Archaeological Museum) - perhaps a bit of “overkill” on the Minoan front, but providing an opportunity to compare and contrast the 4 locations and, potentially, to reassess the chances of any nomination and its likely success. It is worth mentioning perhaps that there are a large number of archaeological sites on Crete which date back to the civilisation now called “Minoan”. They are signposted everywhere when one drives around! For instance we visited the site of a Minoan “town” now called Gournia. It was excavated around 1903 and contains what the archaeologists titled a “Palace complex”. It was important enough to have been called the “trading centre of the island in Minoan times” (Wiki) - but it is significantly smaller than the 3 largest and most famous “palace” sites on Crete. These are all identifiable, according to archaeologists, as being relatable to the later Homeric myth regarding Crete - that there were 3 sons of Zeus and Europa – Minos, Rhadamanthus, and Sarpedon who each became Kings of Crete. Each is associated by inference from discoveries etc with a major “Palatial City” i.e Knossos, Phaestos and Malia respectively. So far so good – but why go further? Aren’t 3 enough? The reasoning for doing so isn’t really addressed in the T List description. Zakros is indeed widely considered the next most important (we didn’t visit it) - but Kydonia doesn’t fit the pattern at all. A cynic might conclude that extending the geographic coverage of a nomination among more Cretan provinces for political popularity reasons might have something to do with it. Others might find “good” archaeological reasons! I await explanations in any Nomination. PHAISTOS is by far the “best situated” of the 4 sites we saw. It occupies a fine hill-top location overlooking a fertile valley of olive groves and more distant high mountains (photo). It contains the “full range” of Minoan palatial structures (see later) and has a major benefit, compared with Knossos, of being fully authentic with none of the reconstruction added by Evans there. It is perhaps most famous for the discovery of the “Phaistos Disk” with its, as yet, un-deciphered hieroglyphic script and one of the “star exhibits” at the Heraklion Museum. The exact spot of discovery is marked by an information board! An aspect to note is that, in one of the distant mountains, accurately aligned with the main palace courtyard, lies the “Peak Sanctuary” of Kamares. Other “Minonan” palaces have similarly aligned cave sanctuaries – but, apparently, it isn’t intended to include any of them with “their” palaces. MALIA occupies a flat site on the north coast near the modern town of the same name (“one of the leading spots for nightlife in Europe” - Wiki!!). Unlike Knossos and Phaistos, its current name is taken from the town and has no connection with whatever it might have been called in Homeric times or earlier. It also is un-restored a la Evans and a particular claim to fame is that the structures from the “Early” and “Late” palace periods are completely separate rather than built over each other (An understanding of the Minoan periods represented within the palatial sites is of help when visiting the sites). A 3rd “area” of houses and workshops – all covered by a large modern canopy was, unfortunately, closed in Dec so I can’t comment on its contents. If you have already seen Knossos and Phaistos (as we had) you will begin to recognise the features common to all “Minoan” palaces - a Great Square, a ritual “lustral basin”, an “altar”, a “Megaron” or 2, a few round storage pits (Evans coined the term “kouloura” for those he found at Knossos after the shape of Greek bread!). storage “magazines” and numerous Pithoi jars. But, notably, no defensive walls. The functions assigned to many of the rooms don’t seem obvious based on what you are looking at but were no doubt justified by discoveries made there (albeit that Evans in particular seems to have been given to “flights of fancy” in support of his preconceptions!). Minoan sites don’t exactly “wow” with their on-view remains – they didn’t “do” monumental statues, carved pillars or mosaics and any wall paintings (apparently “lacking” at both Phaestos and Malia anyway) and artefacts have all been removed to museums - which is why it is so important to go the Heraklion museum to see what was discovered in them. One carved item which is still on show in situ at Malia is a particularly clear “Kernos Stone” whose exact role in Minoan rituals is, like so much else about that civilisation, still shrouded in mystery. KYDONIA was very much the “odd man out” of the 4 “palaces” we saw. It is situated beneath the historic port town of “Chania”. Its name (obviously related to that of the modern town) has been found on deciphered linear B tablets from Knossos and was mentioned in the Odyssey (post Minoan of course). As with Phaistos, its general location had been worked out from descriptions by Strabo but it wasn’t discovered until the almost total destruction of Chania in WWII. Only a few parts are visible where vacant “lots” have been left without modern buildings and excavations have taken place - our map coordinates are exactly correct for the main site which is covered by a large roof. An “advantage” is that, unlike the other sites, “entrance” is free!! Except that “entrance” consists of viewing the excavations on the other side of a steel fence! But it is well explained by signage. However it doesn’t contain any of the “classic” elements of a palace but consists of a few connected rooms and a “street”. This report by the Swedish led group carrying out the recent excavations describes the site, its history and the findings . Note that, nowhere in this report is the description “Palace” assigned to any of the excavated buildings. The same is true for the on-site notice boards AND the UNESCO T List entry. The buildings are described simply as “important”. All that is said is that “a complete inscribed stirrup jar indicating that its contents (were) of royal property was discovered in 2005”. Another major find was the “Master Impression” – a seal described as “one of the most important finds from Minoan Crete”. Its importance lies in the fact that “It depicts a great complex of multi-storied buildings with many windows set in a rocky seaside landscape. Horns of consecration crown the buildings, which appear to be surrounded by a wall with two closed main gates.” Amazingly, it resides in the museum at Chania rather than in that at Heraklion - unfortunately the museum was closed when we were there!!! This article states the arguments for the assumption that a Minoan Palace lies under Chania, but does not claim it as proven - leaving quite why Greece has picked it as one of the 5 “Palatial Centres”, as being “unclear”. So – if you are in Crete, which of the 5 should you visit? I can’t of course assess Zakros, but everything I have read about it would indicate that it doesn’t overtake any of the others. If you had made the journey out to it in far eastern Crete you could already have seen Knossos and Malia so might need to be a real “Minoan buff” to take it in as well! 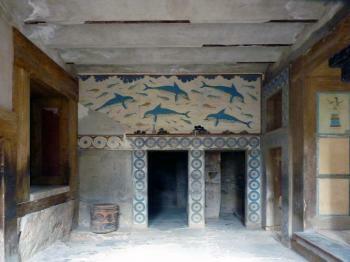 Knossos is un-missable for its size and for its role in the discovery and interpretation of the Minoans. But it is atypical - not least because of the anachronistic reconstructions, so at least a second site is “needed”, both to see an “original” and to identify/cement in the mind the common elements across all palaces. My choice would be Phaistos, but seeing Malia instead wouldn’t be a mistake. Which leaves Kydonia. Chania is a pleasant port town which you might want to visit anyway – if so then it would be silly not to walk the few blocks from the harbour to see the excavations. However, you will not be seeing a typical “Palace”. And what about a possible future nomination? One local I spoke to who I would assess as being reasonably knowledgeable and reliable on the matter, confirmed that Knossos remained problematical because of construction on and around the site which the government wasn’t able to overcome/remove – partly because of cost. I am surprised, since the main part of Knossos seems clear enough (though the extended remains including cemeteries etc may have been compromised) and the souvenir shops and cafés crowding in from outside don’t seem to be worse than those next to many other inscribed archaeological sites - but, no doubt. Greece has received advice on this from ICOMOS etc. As I commented in my Knossos review, I don’t see how adding another 4 locations can overcome or simplify things or mitigate the original problem! I have since seen it suggested that a benefit would be to decouple the nomination somewhat from the Evans “heritage” and theories/approaches which “overwhelm” Knossos but are now considered outmoded. The non-inclusion of the linked “Peak Sanctuaries” could also create a problem – Spain’s Antequera Dolmen inscription took care to include similarly “related” caves. There is also the issue of why these 4 extra locations have been chosen - particularly Kydonia and Zakros. My contact gave no indication of any upcoming change in the situation in the near future so it would appear that this site is likely to remain on the Greek T List for some years to come and also needs a fair bit of work to clarify what should be nominated in order to represent the “Minoan Civilisation” on the List. Knossos was placed 5th in our list of “Top 50 Missing” and was among my personal selected 20 so, when we visited it in Oct 2015, it was with particular interest to try to establish why it still languishes on the T List, whether this is likely to change and whether we agreed with the “failure” (so far) to inscribe! In preparation, I investigated the history of the site’s attempts to gain inscription. Knossos was placed on Greece’s T List in 2000 and I can, so far, find no evidence of any “formal” nomination ever having been made. However local newspapers on the Web indicate that unsuccessful attempts were made around 2003 and again in 2009 – I can only assume that these were “informal” via discussions with ICOMOS etc rather than full nominations. These articles indicate problems with illegal construction and general management and preservation issues. In 2014 a new stage was reached with the extension of the T List description to include other Minoan sites on Crete under the title of “Minoan Palatial Centres” - presumably to strengthen a future nomination case. This report titled "Crete Wants Minoans on UNESCO List" of Mar 2013 states rather hopefully that “The construction problems identified around the area of the Minoan palace that impede the monument’s inclusion might be minor matters since the file will not focus only on the palace, but also on all the monuments of the Minoan civilization.”!!! So, it would appear that the stance being taken by Greece regarding the Evans reconstructions, is that they are an “authentic” part of the history of the site in the same way as are e.g Viollet-le-Duc’s “reconstructions” at Carcassonne etc. The Operational Guidelines, however, state that “In relation to authenticity, the reconstruction of archaeological remains or historic buildings or districts is justifiable only in exceptional circumstances. Reconstruction is acceptable only on the basis of complete and detailed documentation and to no extent on conjecture” - those by Evans certainly don’t meet these high standards but, as per Carcassonne (and other sites), there are plenty of examples of this guideline being “stretched”! This article - “The Reconstruction of Ruins – Principle and Practice” cites Knossos on a number of occasions. It addresses the continuum of “Reconstruction” from minor anastylosis through to complete “Re-creation” and considers the pros and cons towards the latter end, together with the variations across various charters specifying good practice (Including the WHS Operational guidelines!!). It also identifies a number of WHS which you might not have known had been significantly reconstructed!! 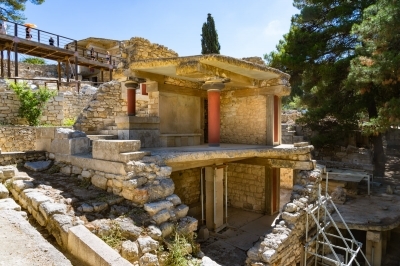 Leaving aside the “Authenticity” issue, it would appear that Greece has been engaged in a significant effort since at least 2000 to improve the preservation and management of Knossos. The notice board I cited above identified 2 different projects - “The "Palace and Archaeological Site of Knossos" project, intended both to deal with the various problems faced by the monument and to promote it, was included in the 3rd Community Support Fund (CSF) in 2000 …. (This) project was completed during the first half of 2009. At the end of 2010, the "Restoration - Promotion of the Palace and Archaeological Site" project was included in the "Competitiveness" Operational Programme of the National Strategic Reference Framework”. Thus, it may well be that the stage is coming close when Greece might feel confident in putting forward Knossos with the other sites for nomination! And what of our visit? We visited the site for around 2.5 hours (enough) in the morning and, initially, it was very busy with cruise ship groups but quietened down significantly later on. We had driven over from Agios Nikolaos and had intended also to visit another of the “Palatial” sites at Malea on the way back but decided during our tour that a visit to the Heraklion Museum was ESSENTIAL in preference to another ruined site. This was undoubtedly the correct decision – you will NOT fully appreciate/understand Knossos without seeing the artifacts from it (and other Minoan sites) in the museum - and many are “World Class” in any case. You can buy a combined ticket at either which saves 2 Euros pp – I personally would take in the site before the museum. It appeared that many areas which could have been visited in the past were now closed off to tourists – this is a common trend in sites which have large numbers of visitors but also reflects a change to put preservation of the site as the highest priority. A lot of new suspended walkways have been built. Major features such as the “Grand Staircase” have been closed for some years as being unstable (it is being worked upon) but now barrier ropes are appearing everywhere! All, no doubt, as part of the overall improvement of conservation which will have to precede any WH inscription. I suspect that relatively few of the people touring the site realized just how much of what they were seeing was reconstructed. I also suspect that, of those who did, very few cared! In creating the superstructure of reconstructed rooms etc Evans was trying both to help preserve the remains beneath AND improve presentation to visitors. Not for nothing had he been a correspondent for the Manchester Guardian - “communicating” what he had found was important to him. The Evans reconstructions are of 2 types – Buildings and Frescoes (Photo). In doing each he determined what the purpose of the room was and what the decorations might have meant. So all the rooms in the “Palace” (and indeed it was he who decided that it WAS a “palace”!) have been given names reflecting Evans’s view of their function. It is not the purpose of this review to assess Evans’s judgements and to what extent subsequent study has found them to be correct or not – rather, simply to point out that everything you see is, to some extent an Evans “creation”. Even the assignment of the term “Minoan” to this early Cretan civilisation was coined by him. “Before you is the “Queen’s Megaron” - beautifully reconstructed with a stunning fresco of dolphins and sea urchins. Next to it is a small room where the Queen took her bath…….” Well - possibly, but, more likely, probably not! Any building on the site currently with walls and pillars (and there are a lot!) has actually been reconstructed from the ground up. Evans believed that the original “palace” had 2 or 3 stories (hence e.g the “Grand Staircase”) and reconstructed these with concrete pillars, roofs and floors. The rather strange shape of the pillars (wider at the top) does appear to have been historically correct – the Minoans used Cypress trunks which they placed upside down to prevent sprouting! The bright colours have been changed even since Evans created them! The above article on reconstruction notes that it is very difficult for “reconstructions” to avoid adopting the subconscious stylistic standards of the era in which the reconstruction was carried out, and there is no doubt that the Knossos reconstructions have an “art deco” feel about them which is very much of “their period” even if they were intended to be from 1900BC!! Where buildings have been reconstructed Evans arranged for copies of the frescos thought to have been on their walls to be recreated on site. This is where a visit to the museum is required. Only a few fragments were found of each of the original frescoes. At the museum you will see how these have been “converted” into large wall paintings with just a few of the originals visible scattered across the entire “canvass”! These at least have some “original” material in them (though whether in the right place or not is another matter!) - those at Knossos itself are of course entirely re-copies of these museum “creations”. Yet I didn’t feel “cheated” by all this. I am happy to receive newer alternative theories about the site and to accept that much of what one sees there would not have been created in 2015! But what is on show is a piece of history in itself and fascinating both as ancient and as “modern” history. It might have been better if Evans hadn’t built on top of the old ruins but he was no fool - he did help preserve them (which was more than some contemporary archaeologists did elsewhere) and he documented and preserved what he found superbly (as evidenced in the museum). His work provided a major step forward in understanding early Aegean civilization and the site exists both as an example of that civilization and of the history of archaeology. I see no reason why it should be precluded from inscription because of the early 20th C “additions”!